Highly customizable biscuits for any occasion, just switch up the colored candy sprinkles for a festive look. 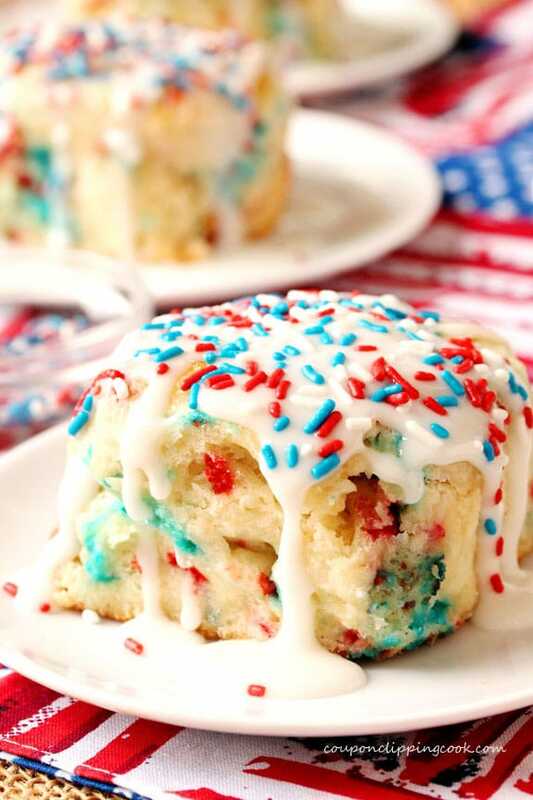 These patriotic biscuits have red, white and blue inside and out. 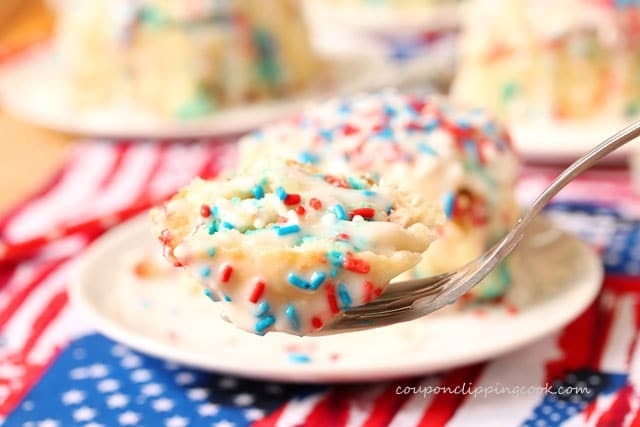 The fun part about these biscuits is that the color of candy sprinkles can be changed up for any occasion. And so can the color of the icing for that matter. 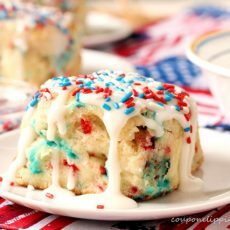 This icing has a bit of lemon juice in it which adds a hint of tart flavor to contrast the sweetness of the icing. These biscuits are made in an iron skillet which is my favorite way to make them because the sides of each biscuit bake up against one another. Then when the biscuits are pulled apart the sides are super soft. 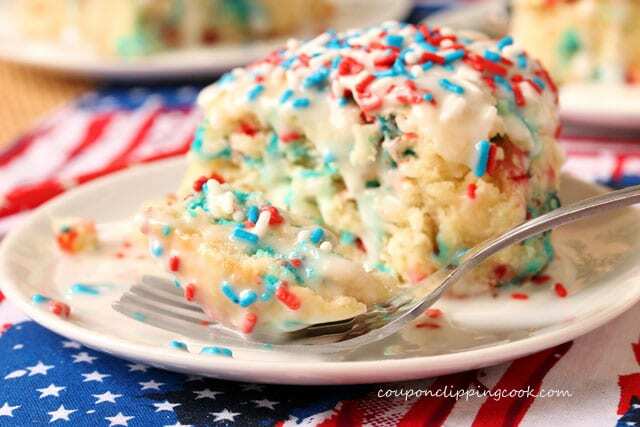 Here are some more scrumptious recipes with skillet biscuits “Skillet Biscuits with Sage Sausage Gravy“, “Sugar Coated Biscuit Strawberry Shortcake“, and “Snickerdoodle Skillet Biscuits“. 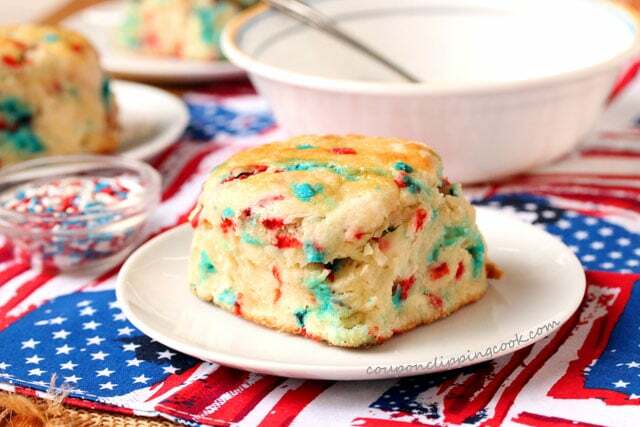 The hardest thing about making these red, white and blue biscuits is the red, white and blue part. The hard part isn’t actually making them, it’s finding these colors in the grocery or craft store. You know how it goes, when you’re not looking for something, is when you find it. 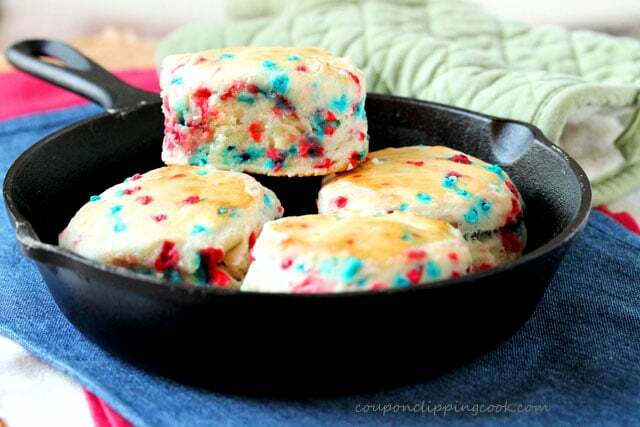 The jimmie candy sprinkles work well in these biscuits because they stand up nicely in the dough. 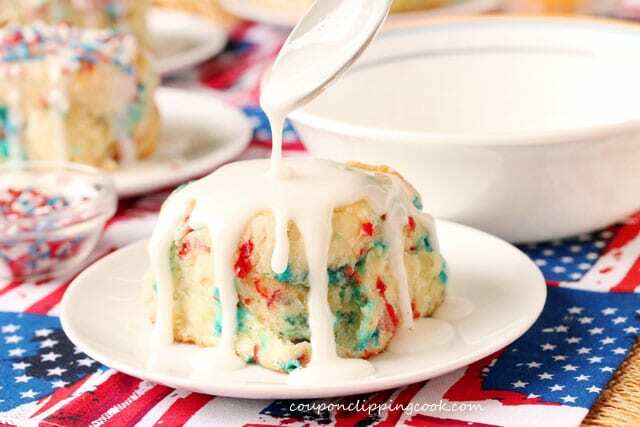 In a pinch, if only the blue and red ones are available that should work just fine when using white icing. Preheat the oven to 450 degrees F. Grease the skillet (8-inch iron skillet) with butter along the bottom and sides of the pan, and set aside. 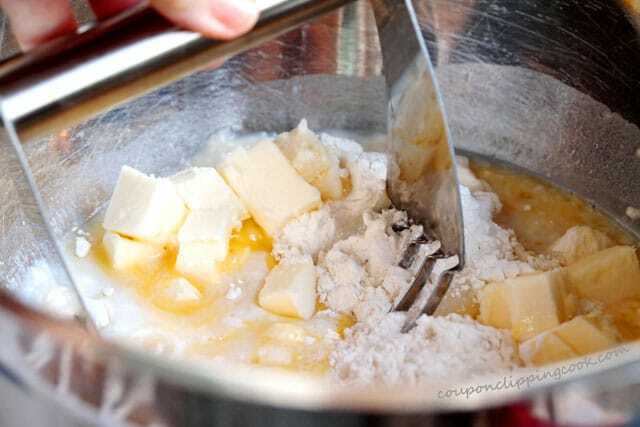 Add the chilled butter (cut into cubes). 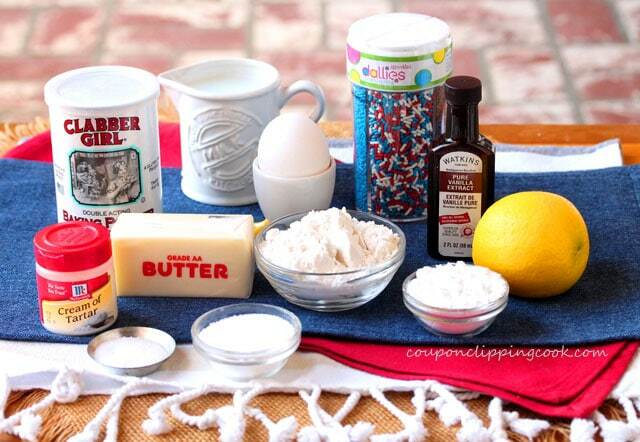 cut the butter into the ingredients to make the biscuit dough. 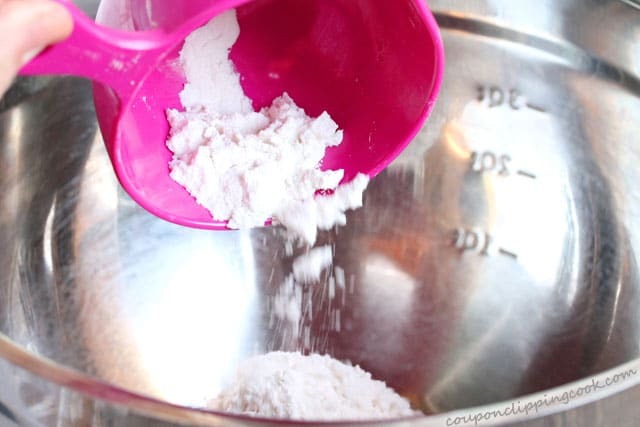 Sprinkle flour on to a large cutting board and add the dough. 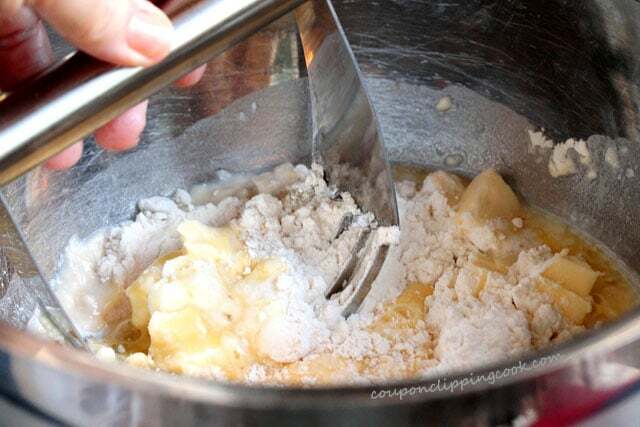 Make a small “well” in the middle of the dough and add one-fourth of the jimmies. Knead the dough while at the same time mixing the jimmies into the dough. Mix another quarter of the jimmies into the dough. Repeat with the remaining jimmies, adding more flour to the cutting board as needed. 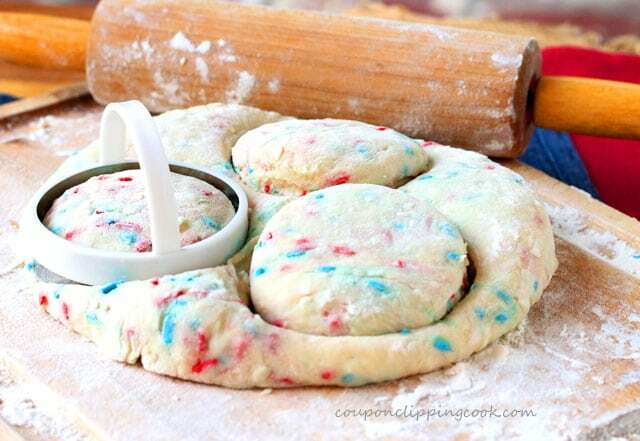 Roll the dough with a rolling pin so that it’s about 1-1/4 thick. Using a 3-inch biscuit or cookie cutter, cut the biscuits. You may need to cut just 3 biscuits out of the first batch and roll the remaining dough for the fourth biscuit. Add the biscuits to the greased skillet so the side of each biscuit is touching one another. 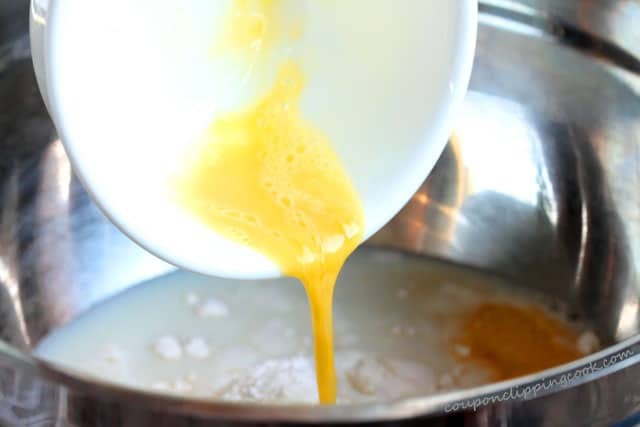 For the egg wash – in a small bowl add the egg and water. 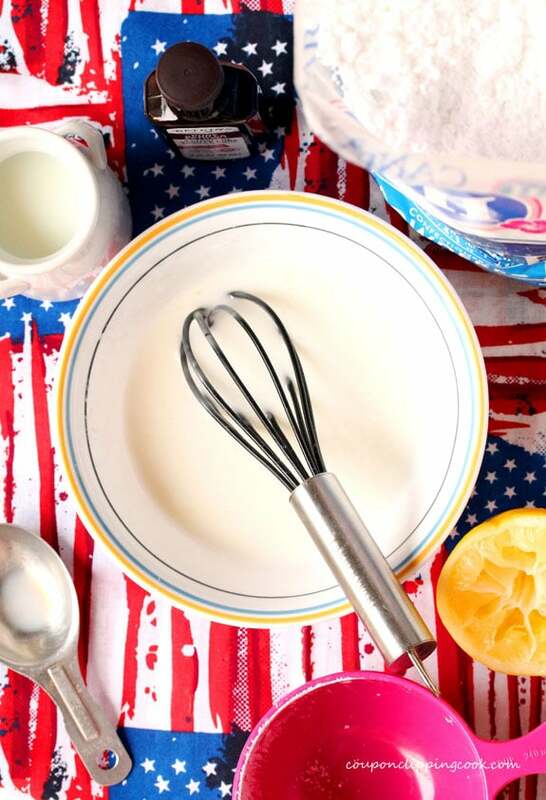 Whisk together and brush on top of the biscuits. Bake in a preheated oven until the tops of the biscuits turn a light golden color (about 16 minutes). Remove from the oven and let slightly cool (about 5 minutes). The biscuits should still be hot so carefully transfer them to the serving plates. While the biscuits are cooling make the icing. 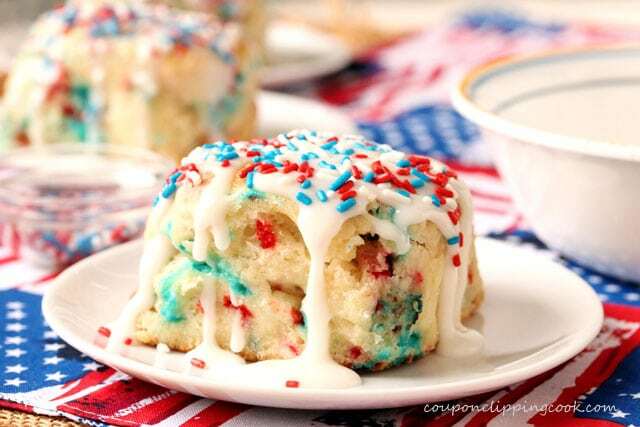 In a small bowl, add the icing ingredients and whisk together. 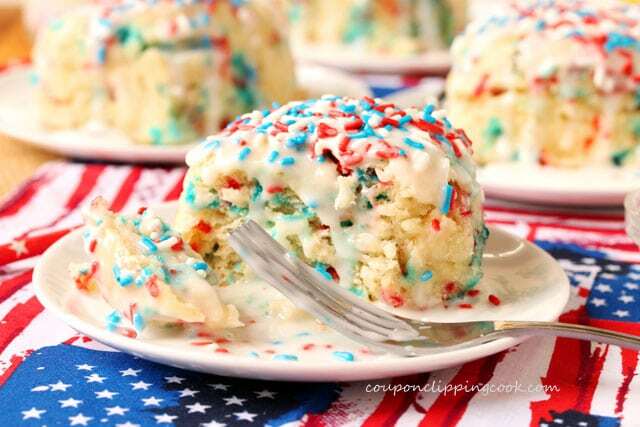 …immediately top with jimmies to garnish before the icing sets. Highly customizable biscuits for any occasion, just switch up the colored candy sprinkles for a festive look! Preheat the oven to 450 degrees F. Grease the skillet with butter along the bottom and sides of the pan, and set aside. 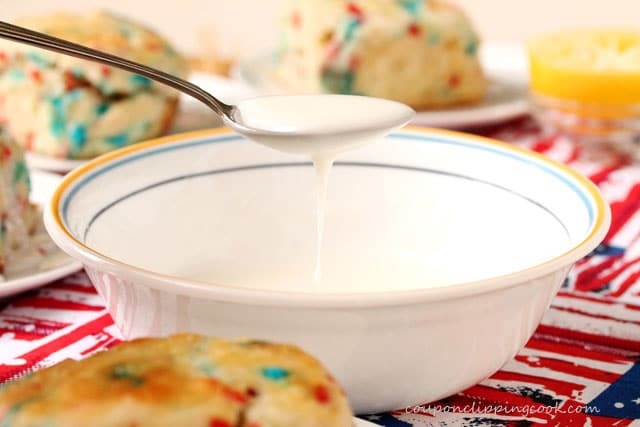 In a large bowl add the flour, baking powder, salt, sugar, cream of tartar (optional, helps to make the biscuit light and fluffy), milk and egg. Stir together. 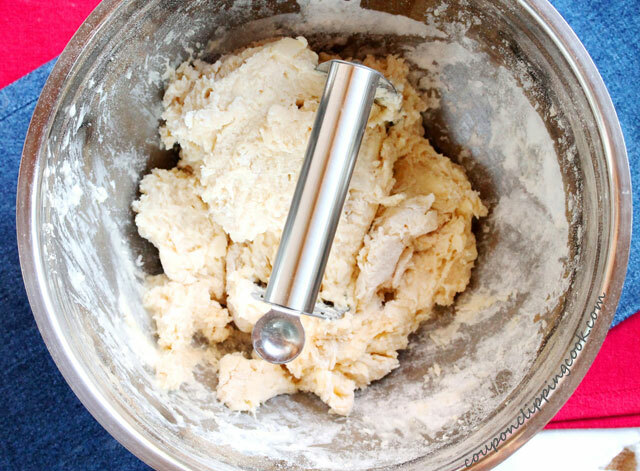 Using a pastry cutter or large sturdy fork, cut in the butter to form the dough. Lightly flour a cutting board and transfer the dough on to the cutting board. 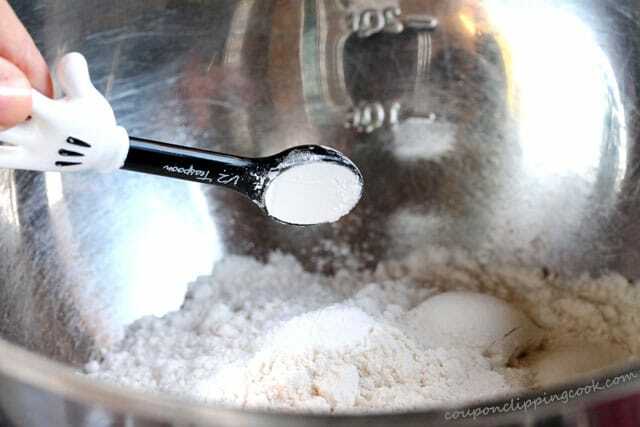 Make a “well” in the middle of the dough and add about a quarter of the candy jimmies. Knead the dough while at the same time mixing in the jimmies. 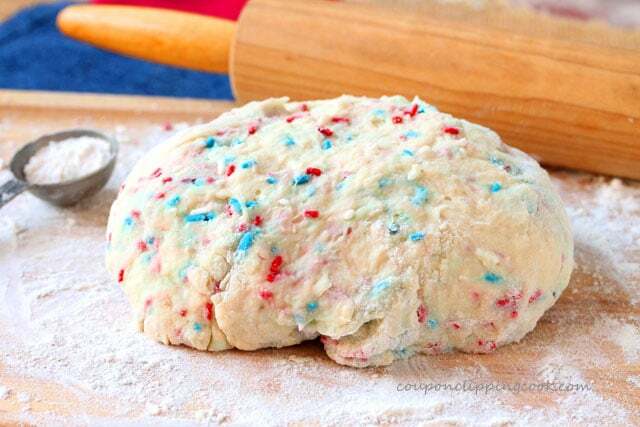 Sprinkle more flour on the cutting board and add another quarter of the jimmies to the dough. 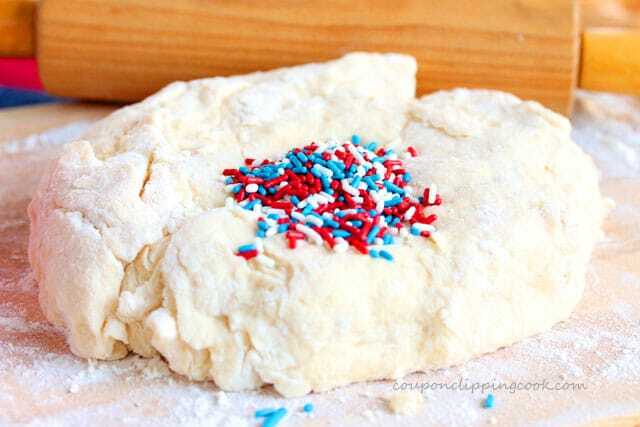 Continue to knead and mix the remaining candies into the dough, adding more flour to the cutting board as needed. Roll the dough with a rolling pin so that it's about 1-1/4 thick. Using a biscuit or cookie cutter, cut the biscuits. You may need to cut just 3 biscuits out of the first batch and roll the remaining dough for the fourth biscuit. 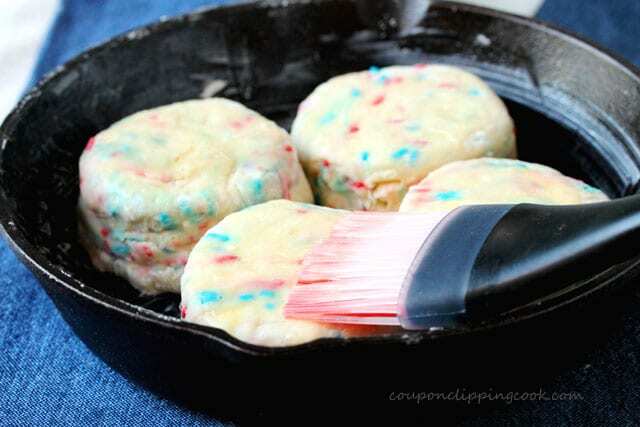 Add the biscuits to the greased skillet so the sides of each biscuit are touching one another. For the egg wash - whisk together the egg and water. With a pastry brush, brush the tops of the biscuits with egg wash.
Bake in a preheated oven until the tops of the biscuits turn a light golden color (about 16 minutes). Remove from the oven and let slightly cool (about 5 minutes). The biscuits should still be hot so carefully transfer them to the serving plates. 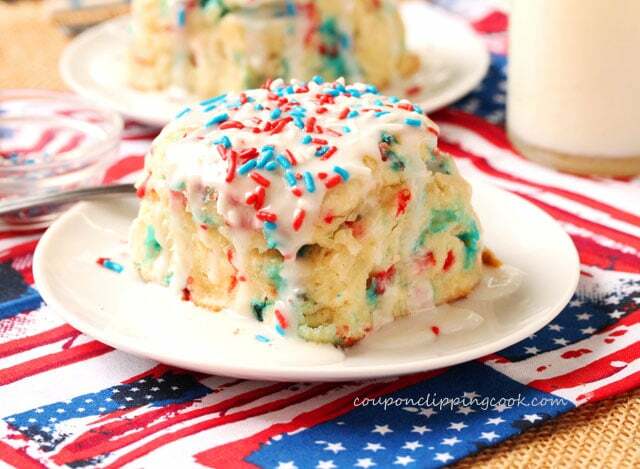 One at a time, drizzle icing on top of the biscuits and immediately top with the candy jimmies before the icing sets. Serve while warm. They are So festive. Love that you can change the colors for different occasions.